Lots of work travel, but I finally got a weekend at home and managed to whip up something to take to work during the week. Marinade: salt, pepper, red chili flake, misc "italian seasoning blend"
Came out super tender, a tad salty. Yum. So, a friend of mine had a free week to give away for me to try out My Food Bag. They are in both Australia and New Zealand I know there are similar services in the US. The high level idea is that they deliver a box (or boxes) of groceries that have been pre-portioned and partially prepped with a series of recipes. 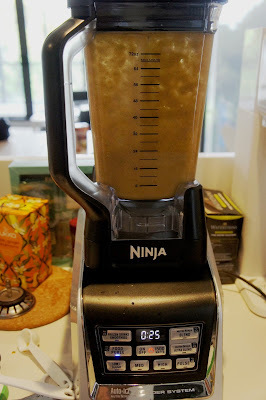 It saves you a trip to the grocery store and simplifies meal preparation which is nice after a hard day at work. I really love the process, you pick your box type: classic, family, gourmet, or own (single diner) on the website, and they send you a mail and follow up text on when they will delivery and it just shows up. You get another email during the week to let you know the recipes so you can read through and buy any staples you might be out of. 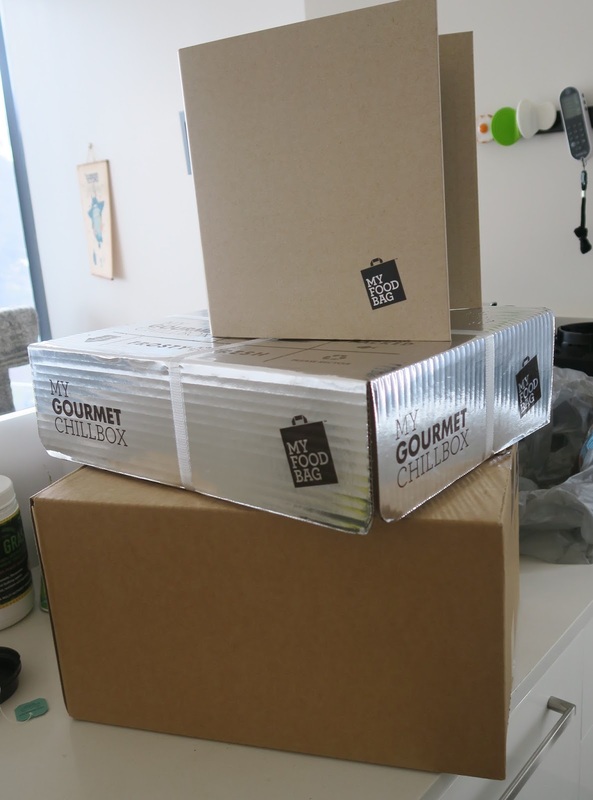 This box is four meals for two people (the different boxes feed different amounts). Disclaimer: this was provided free for me, but no one asked me to post anything, it's just my honest impression of the service. As you can see I got two boxes. 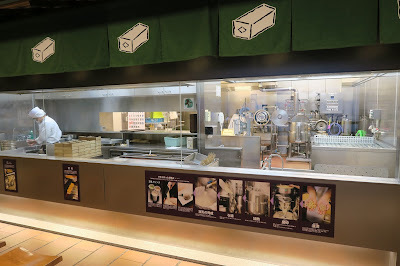 The first box was a "chill" box which contained all the cold goods packed with a reusable ice block, if you're not home they'll stash the box somewhere out of the way so the ice bag helps keep your meats and perishables intact until you're able to get to your goods. Picture of the second 'non chill' box. As you can see, stuff is portioned out for cooking. Some of the ingredients are more than you need for the recipes, some are used for multiple recipes. There are some staple items that they expect you to have on hand. It's denoted in the recipe legend. Spices are pre-measured and bagged as well as any sauces or marinades, super handy! For the first delivery they also give you this great little binder to collect all the recipes you cook. It contains a brief overview of the service, staples you should be stocking. They even talk about food safety. This is a nice touch, we've tried other services and the cards are all over the place. So what are the recipes like? Well, as soon as I got the box it was nearly lunch time so I broke out the first recipe: Crispy Skin Salmon with Alpine Pesto Freekeh and Greens. I gathered the simple ingredients (I had to supply butter/ghee) and below are literally the six steps I followed to getting lunch done. (OK I lied, the broccolini needed to be cut into three segments but that's the only pre-prep other than washing stuff. 2) while the freekeh is going cover the snow peas and broccolini in boiling water from the kettle. 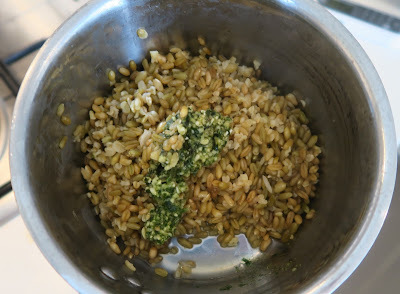 5 and 6) (melting butter is not an exciting picture) wipe off pan, melt butter saute the snowpeas broccolini and spinach. I deviated here and used the "full punnet" since the spinach wasn't being used anywhere else. 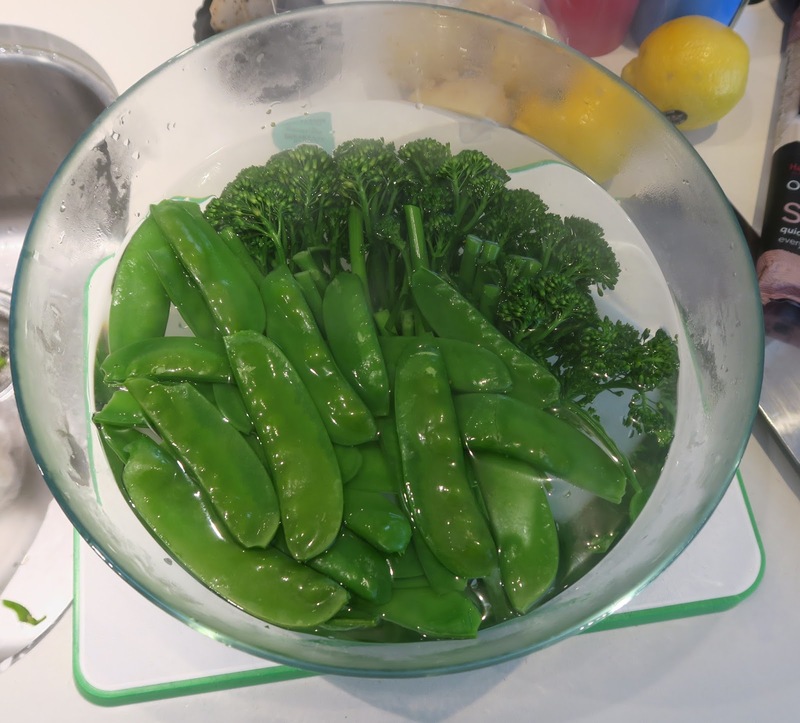 I made the mistake of using all of the snow peas I didn't notice the icon that it was being used in another recipe. It was as easy as It sounds. The recipe card said 25 mins cooking time. I seriously doubt it took me that long. I really like the convenience of the service. The folks at My Food Bag take you through the entire service. The produce was fresh and well packaged. Living in Sydney, I’ve learned the value of groceries being delivered. I was very accustomed to living back home where I could pile just about anything I wanted into my car and drive it back. When you have to carry everything home you start getting pretty picky about what you buy and stock at the house. Having everything basically prepped and ready for you was a huge benefit as well, it made cooking a breeze. The “Missus” even found it pleasant to cook so it was nice that it helped her enjoy cooking. Some of the ingredients say thing like 1/2 a punnet of XYZ. (punnet is a tray, or container) It would be nice to have an actual weight measurement. I realize you're cooking from their service, but I think the point of giving us the recipe cards is that we might want to re-create the meal one day even if it's not in "my food bag" for the week. It'd be nice to know how much half a punnet of spinach was because the it didn't seem like a standard size of spinach (100 grams) since the grocery sells it in bags (350grams). Not a big deal since I just wrote my own notes on the card just a nitpick. The other thing is, since we’re trying to live a low carb lifestyle I kind of wish they had that type of option for a bag but I understand that it creates another variation and complexity to their service. That said each recipe is created with “healthy” in mind and they even list the nutritional facts. Would I recommend the service? Absolutely! Would I personally continue the service? I definitely think I would, we’d have to reconcile the low carb thing. The price of the bag I picked (the gourmet) was $140 AUD (Australian dollar). I think it’s worth the price if you divide it out it’s cheaper than going out to eat About $17.38 per person. There were other bags that brought the dinner price down to $6.36. Can you do better shopping for yourself? Sure, but the price of convenience and prep goes a long way. We try our best to cook for the week but with both of us working it’s tough so cooking becomes a production and spending time in the grocery store cuts down on our weekend time so we either burn time or go out to eat. Just threw together this quick lunchbox for tomorrow. Sous vide rack of lamb: Fresh chopped rosemary, thyme and oregano cooked at 134F (56C) for four hours. Accompanied with Sauteed mushrooms (button and golden needle), garlic spinach and zoodles with tomato sauce. So this paleo/gluten-free friendly mug bread has been making the rounds on facebook recently. Mug/microwave cooking has been around for a bit but people have gotten pretty creative over the years. I mentioned that I should created a bento box out of mug items made in a microwave. Since it's a rainy crappy day outside I decided to play in the kitchen. The microwave is a surprisingly versatile piece of equipment. I usually use it to reheat items (never to my satisfaction). There's some debate what the nuke box does to nutrients, some say it preserves them, other say they get nuked to death. All the supporting scientifically measured evidence I've read seems to support the former. Anyhow, that's not the subject of this post, the challenge: make a bento box around items you make in a mug and a microwave. I settled on brunch because it's probably the easiest thing to do because eggs are easy and most every other recipe out there sort of dessert or cake so brunch is the closest thing I could use to compose a meal. I already had a bread so I figured on some sort of "golden arches" type breakfast muffin with an accompaniment. I'll admit I cheated and used a ramekin because it has a wider mouth and allowed for better pictures, it's just a large handleless mug. First up I had to test the english muffin. All of these recipes were pretty simple. 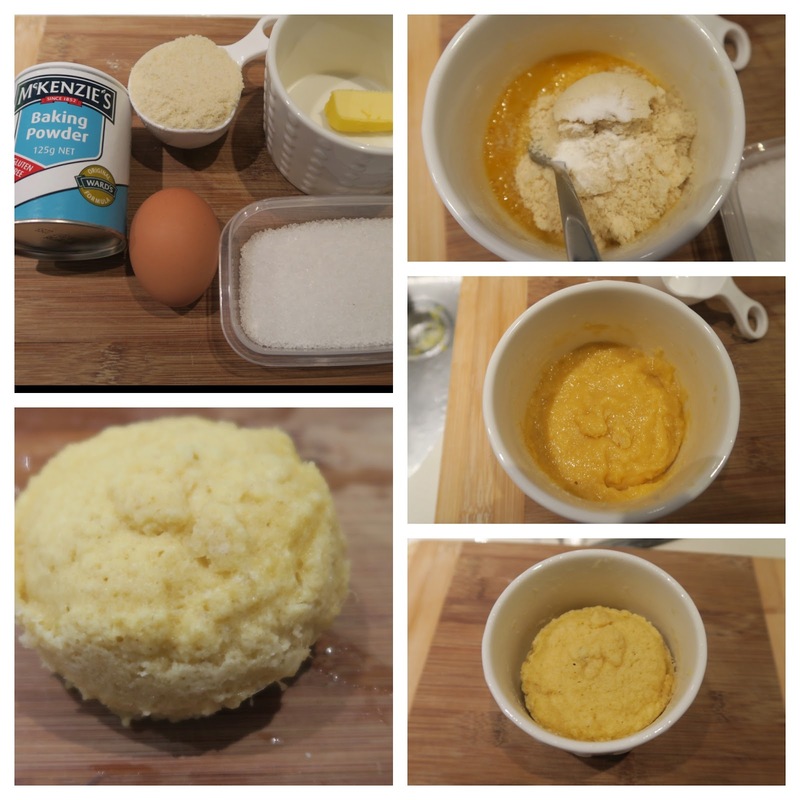 Ingredients: 1/4 cup almond flour, 1/8 tsp baking powder, 1 egg, 1 tbsp butter, and a pinch of salt. I nuked the butter for 30 seconds in the microwave and stirred the butter until it was fully melted. I then tipped the mug on it's side and coated the edges. Stir in the ingredients and mixed until incorporated. Set the microwave for 90 seconds on full power and let it go. The resulting bread was pretty dry, not exactly like an english muffin, but it had air pockets and was pretty springy. It's definitely a gluten free bread. As one of my friends pointed it looked like the insta-bread that Rey made in the new Star Wars movie. Ok bread: check. Best thing to do with this thing was some sort of egg type muffin. And the easiest was a scrambled egg. 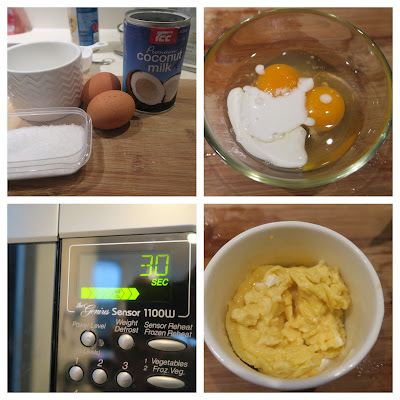 I didn't have any milk on hand but I did have some coconut milk since we're doing the paleo thing. Ingredients: 2 eggs, 2 tbsp coconut milk, a pinch of salt. I sprayed the mug with cooking spray and whisked everything together and put it in the mug. I set the microwave to 70% power and nuked it in 30 second increments stirring along the way. After the third trip the egg was as you see in the photo, still a little runny but the carryover heat from the mug and egg let it set nicely. The eggs were well cooked and still soft. Beware overcooking, they become tough and rubbery if you nuke them too long. Now for a side. Veggies are the easiest thing to prepare in a microwave. Many super markets sell broccoli and cauliflower in a bag and you microwave them for 2 mins and they steam in their own baggies. I figured I could probably do the same thing with green beans. Ingredients: 1/2 tbsp butter (optional), pinch of salt, 1/2 cup green beans, 2 tsp water. 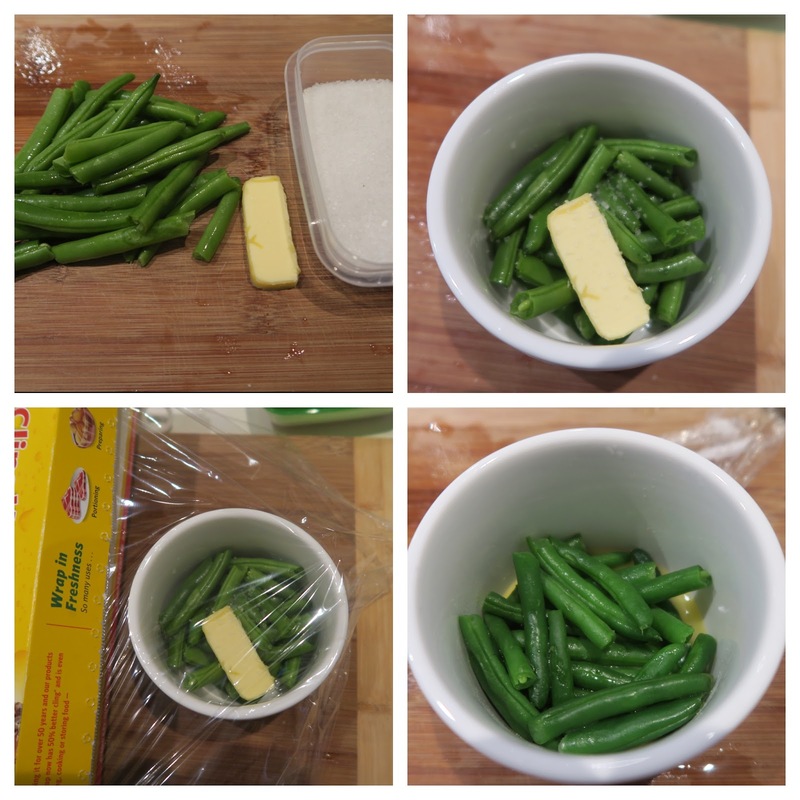 I hand snapped the green beans to fit in the mug, dropped in the butter, pinch of salt and added a bit of water to the bottom of the mug to help with steaming. I sealed the mug with cling wrap and poked a few holes at the top and set the microwave to 90 seconds. The green beans were soft and retained their color I think 60 seconds would be fine if you still want some snap to your beans. I thought the egg muffin was probably too dry on it's own. I figured a topping of a simple tomato sauce would probably spice things up a bit. I had some left over crushed tomatoes from a can, garlic in a tube (I'm not too proud of that one) and fresh thyme, so I went to work. 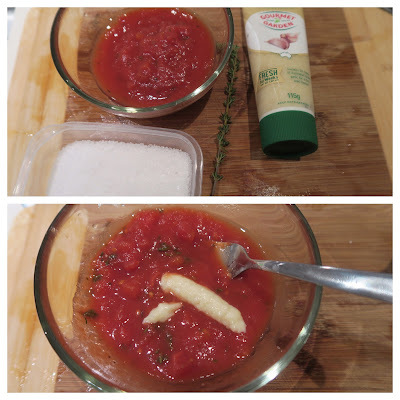 Ingredients: 1/2 cup crushed tomato (or diced), 1 sprig of thyme, 1 tsp minced garlic, extra virgin olive oil (not pictured). If you want some dried oregano and basil would go well here too. I mixed everything up and added a splash of olive oil. I covered the mug in cling wrap and poked some holes and set the microwave to 60 seconds. I gave it a final stir before topping. Here's the meal plated. Total cooking time: 10 mins with prep. I wouldn't call this a masterpiece but, if you have a few mins and are at the office I could see how you could make this happen. It's definitely tastier than some of the microwave breakfast items I've had from the freezer. For the speed and convenience I'd give it a thumbs up. As usual it's been a busy work season, but that really hasn't prevented me from cooking. In fact I've been doing a lot of cooking over the last few months and I have a pretty big backlog of posts to put up, just no time to post. 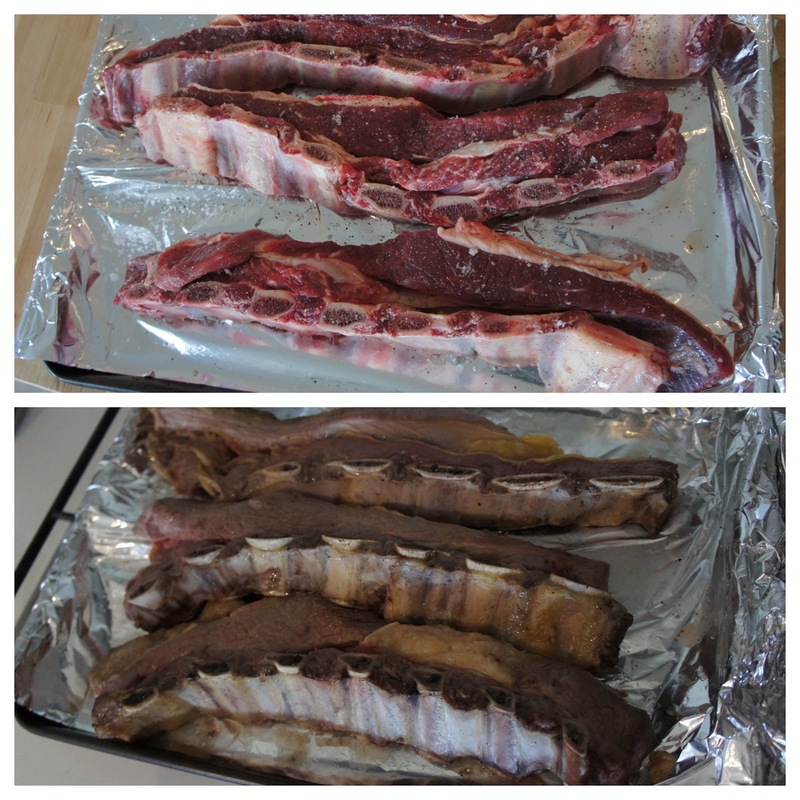 We've been doing a lot of paleo cooking, it's had modest results on the waistline but done wonders in terms of saving money. Living in a big city it's often easier to walk down the street to grab some food than to buy a ton of groceries and prepare it yourself (especially after a long day at work). I try my best to do a lot of cooking over the weekend but there's only so much leftover I can take. First world problems, I know. 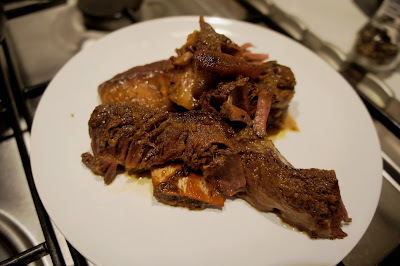 Anyways, I saw this Slow cooker Korean Grass fed short rib from Nom Nom paleo (they modded it from America's Test Kitchen), and as you know I'm a big fan of using the slow cooker so I wasn't going to pass it up. I couldn't get grass fed beef or some of the paleo friendly sauces but I was able to gather most of it. 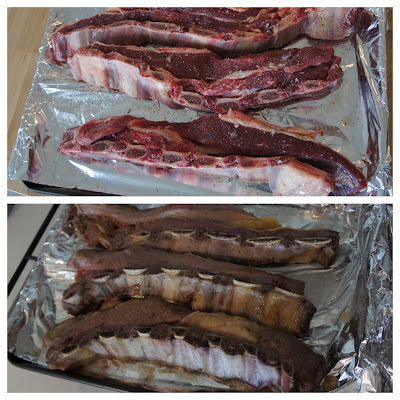 The recipe called for broiling the ribs to get them brown, this is a great way to brown the meat, as six pounds of beef rib is a bit unwieldy and messy to brown up in a skillet. The Test Kitchen's book suggest microwaving which also helps brown the bones, something I'll have to try next time. The braising liquid was a sauce made of vinegar, asian pear, ginger, garlic, scallions, fish sauce, and cilantro whizzed together. They used the cilantro as garnish but I decided to put into the sauce. 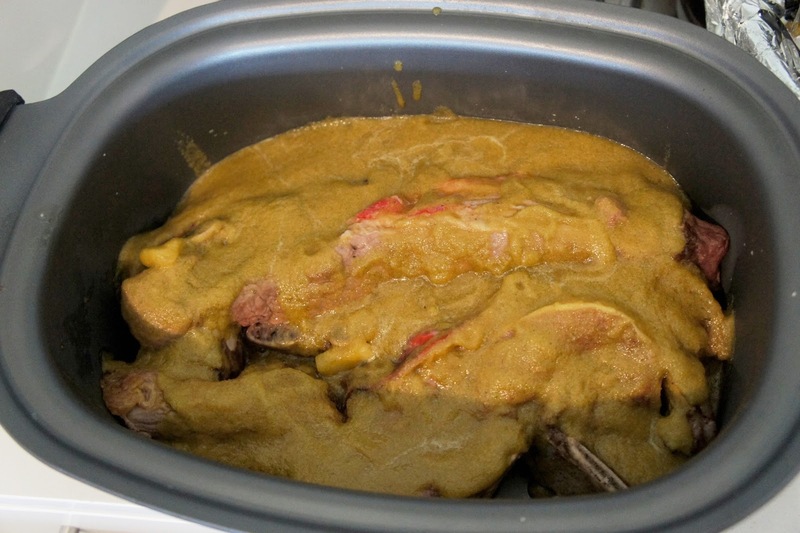 Toss it all together in the slow cooker and let it go. Nine to Eleven hours was the cooking time, I would probably go with closer to eight on low. The beef was a little *too* fall apart. The fat renders and there's a surprising amount of liquid when it's all done, so don't worry about the possibility of it drying out. Not the prettiest of pictures but very tender and the asian pear gave the beef a slightly sweet taste. I was quite happy with the results. 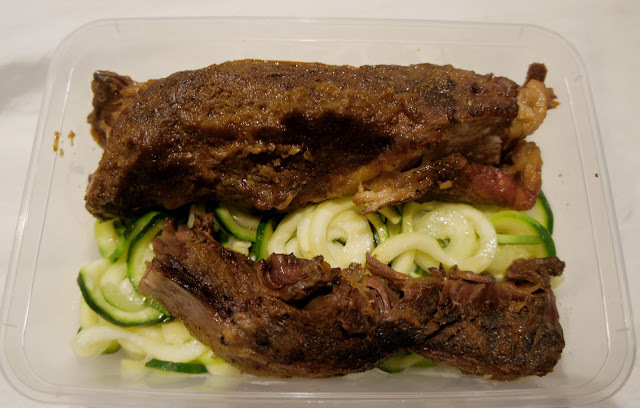 I served the beef rib with a helping of sauteed "zoodles" to round out my lunch box. This time the zoodles were less about the noodle effect and more of a vegetable component. I think if you wanted to go with a more "classical" side dish you could do a roasted vegetable or cauliflower mash, I was pretty happy with the zoodles though. Set oven to broil. Salt and pepper all sides of the beef rib and place on a foil lined baking sheet. 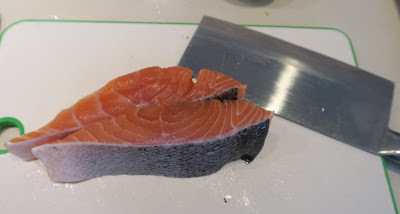 Broil for 5-7 mins per side (depends on your broil setting) until meat is browned and fat has some crispy bits. Place pear, garlic, coconut aminos garlic, fish sauce, coconut vinegar, chicken stock and cilantro in a blender and puree until smooth. 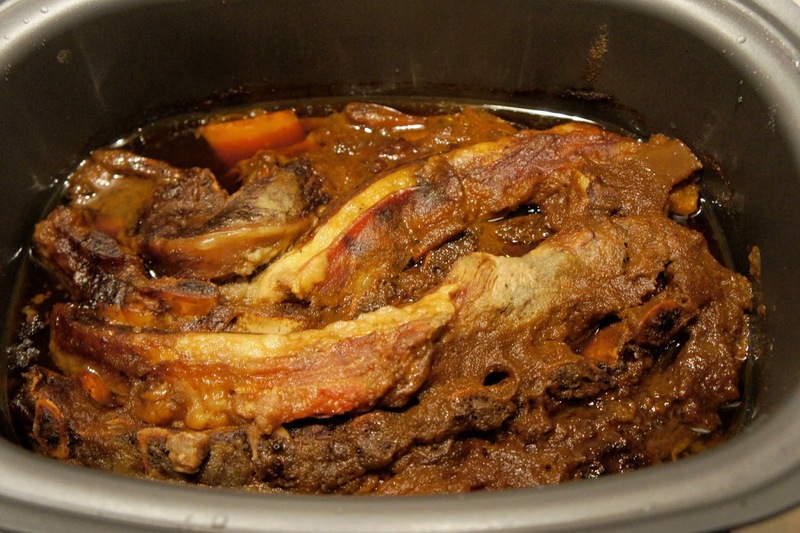 Place beef in a single layer in the bottom of the slow cooker and pour sauce over the ribs. Cook on low heat for 8 hours or longer depending on your desired texture. Spiral slice zucchini and place in a colander. Liberally sprinkle with salt and let stand for 30 mins. Shake dry. Pan fry zucchini noodles for until soft. Finally getting around to posting our second fabulous meal in Tokyo. 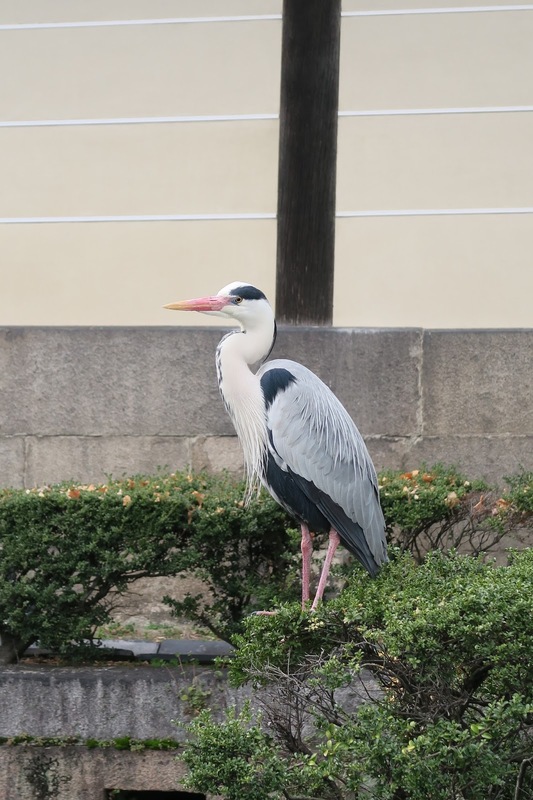 We met another friend for lunch near in the Ginza area. She suggested Aya and booked us a seat for an Omakase lunch. aurant, as you can see the front door is a little tucked into the building and just like the other place you probably wouldn’t have thought the door lead to a restaurant. Inside the restaurant sat a total of eight people. The Chef worked in the center and as you can see there was a wall of beautiful dishes that he plated his creations, the space was very efficiently used. There were two waitstaff that assisted with bringing out things from the back as well as tending to your needs. 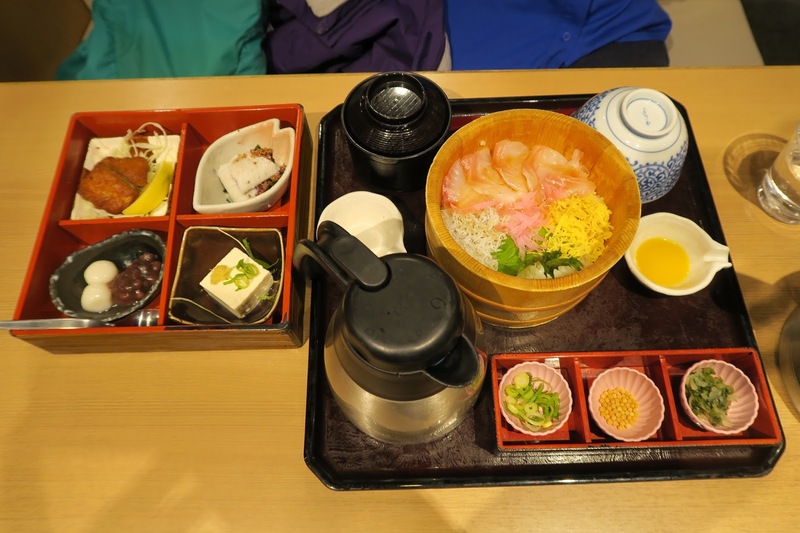 I really like this style of eating, you feel very close to the restaurant and the people designing the wonderful food and ambiance that you are enjoying. Although the chef didn’t speak much english between ingredients and words I was familiar with (and gestures) I was able to understand most of his meaning even when our friend had to leave (lunch took a few hours and it was a working day). Every course wait ate was a work of art and the dedication and these folks brought to their craft was amazing. Opening course: steamed broccoli and potato with miso dressing, young white eel in a soy ponzu sauce, and salmon roe with seaweed and braised bamboo shoot. The eel was similar to the white fish we ate for dinner, except not live this time. Sashimi course of tuna and scallops. it was served with a citrus soy dressing. Next came a soup course, it was a flavorful broth with fresh shiitake tofu shrimp and a fresh clam. The serving vessel was brought out and unveiled the stand heated the soup vessel to boiling and the clam slowly opened up. 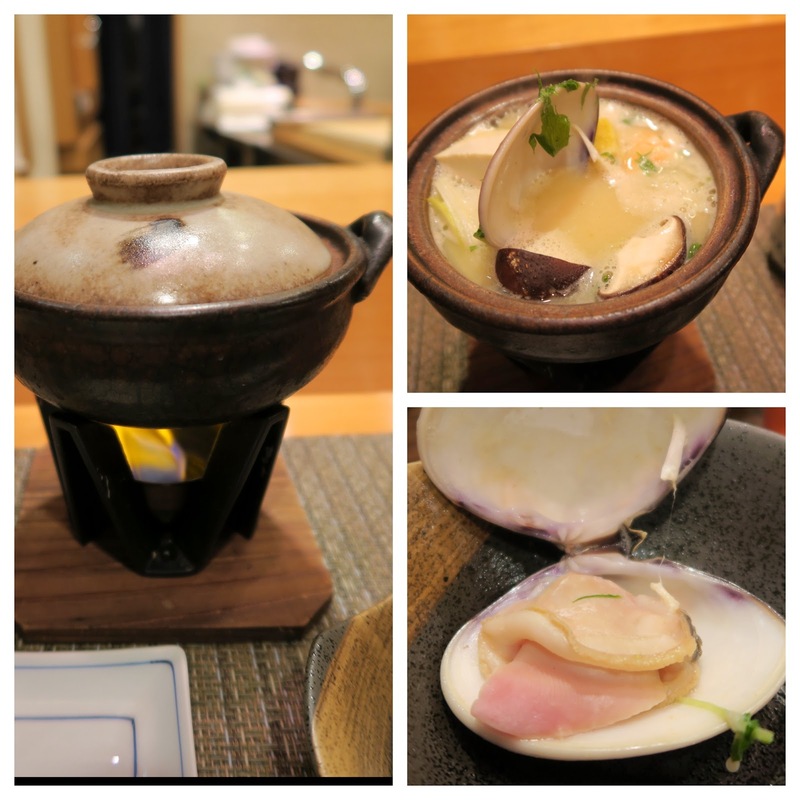 The chef explained that this soup is also served as part of “Hinamatsuri” or girl’s day and the clam symbolized a wish for a finding your true love, as both halves of the clam shell can only match the original whole. Sea urchin with mushroom and seaweed terrine. There wasn’t a lot of flavor to the terrine jelly, but there were some interesting textures going on, I think the jelly was achieved using agar agar, which makes sense with the whole seaweed theme. The sea urchin was (just like every sea urchin I ate in Japan) deliciously rich with a hit of brine. Watching the chef work was a treat. Self grilled selection of Wagyu and Kobe beef. The Kobe beef (show on the bottom of the grill) was extremely marbled, I’ve never seen anything like it and the flavor was rich, meaty, I know it looks like you’d be eating a solid piece of fat but it was nothing of the sort. Next came a rice course called Takikomi gohan I had the chef spell it out for me so i could try to make it myself, he said it was pretty simple dish. 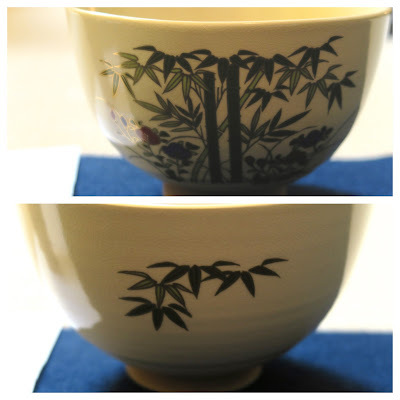 He explained that rice was cooked in a earthenware bowl and the cooking liquid was a dashi and a bit of soy sauce. The brown pickle to the side was a daikon radish that had been buried in Sake Kasu (the left over rice when they make sake) for three years. This was the earthenware pot that the rice was cooked in and it was full of rice.We were getting full at this point and gratefully took the extra rice home (which made for a delicious morning breakfast with some miso soup). 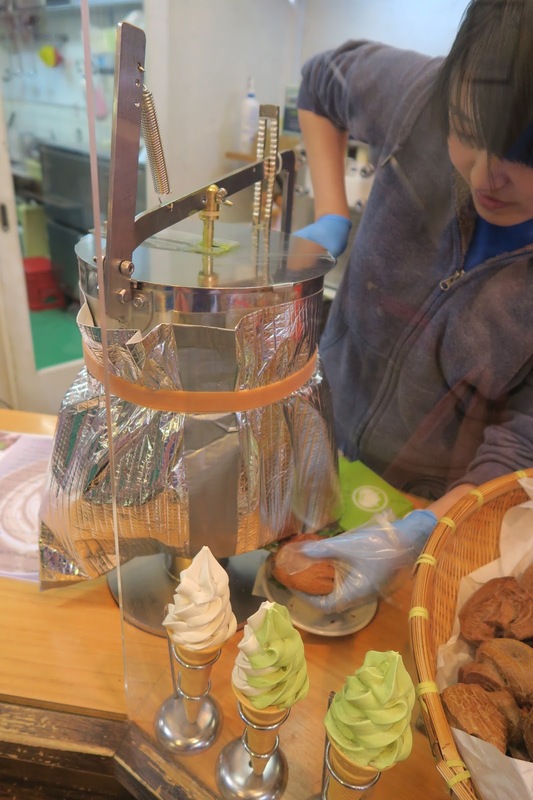 To finish things off we had a bit of Matcha Warabi mocha in a syrup with fresh strawberry and what looked like a large kumquat. The fruit was larger and sweeter than a kumquat. 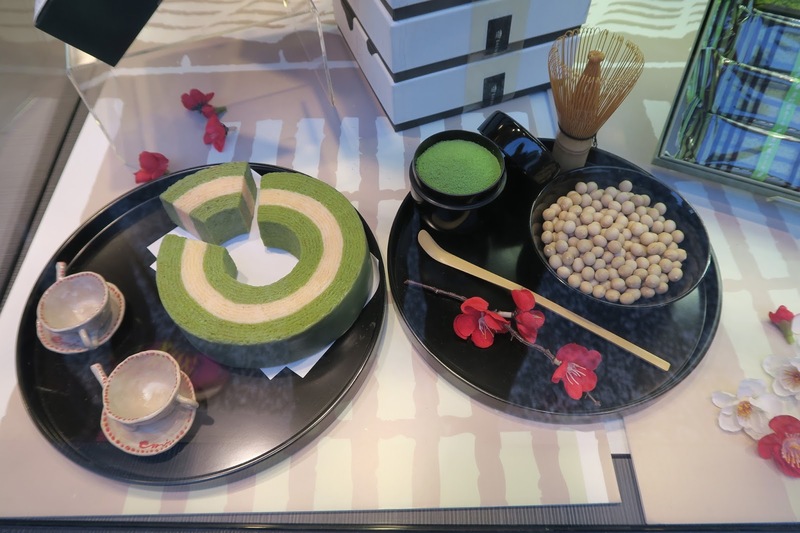 Finally we end with some Matcha and a single sweet bean, literally a bitter/sweet end to our meal. We enjoyed it so much we hated to leave but after three hours we were quite full! As I said, this was one of our most memorable meals in Japan. I can’t imagine that folks can normally spend three hours on lunch here, but the experience was phenomenal. 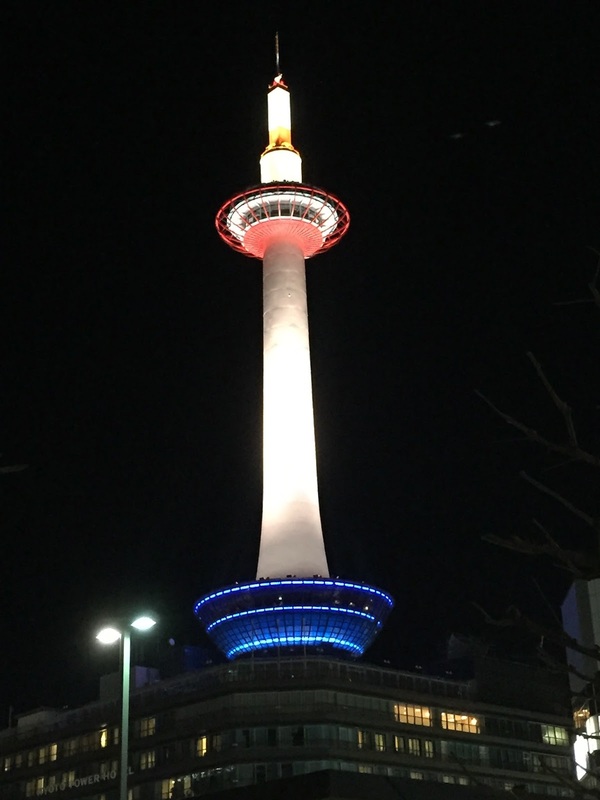 Man I miss Japan, I want to go back as soon as possible! In the middle of our trip we took a four day excursion to Kyoto. 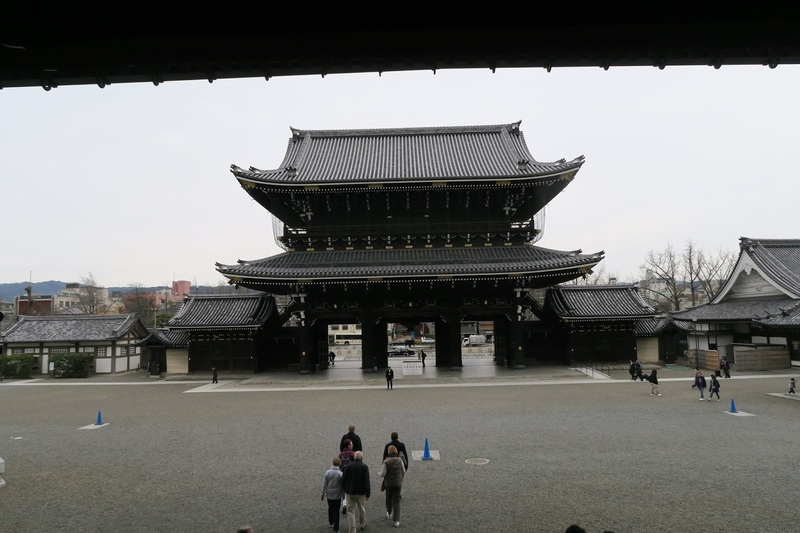 The city once was the capital of Japan until the Emperor relocated the capital to Tokyo. Kyoto is a very different city compared to Tokyo, it has a fraction of the population (1.5 million) and as a result is not nearly as busy. Kyoto is known for old architectural buildings as well as lots and lots of temples and shrines. 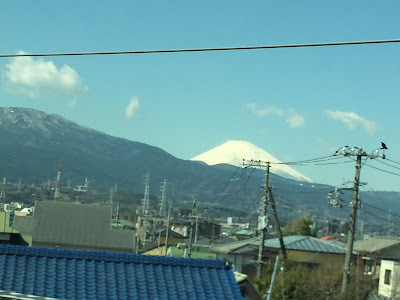 We passed Mt. Fuji while on the bullet train. 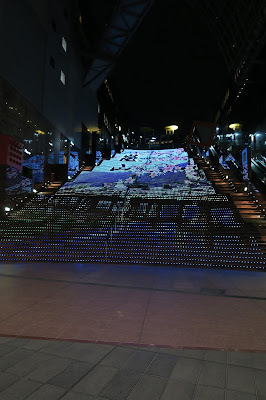 We only had two solid days in the city since the first and fourth days were consumed with travel. Riding the Shinkansen (Bullet train) it took us 2.5 hours to get to Tokyo not bad for covering 320 miles. Kyoto train station is every bit as large as Tokyo's. 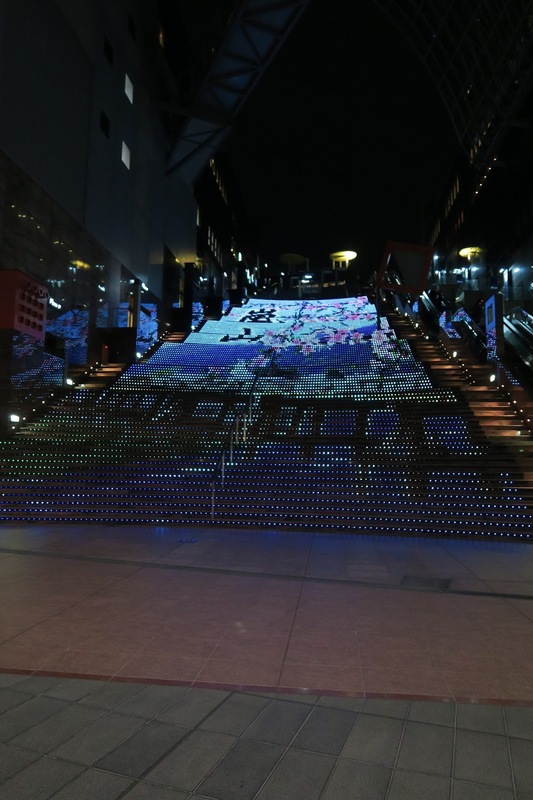 It's got at least two department stores and a hotel attached to it with a huge variety of restaurants. 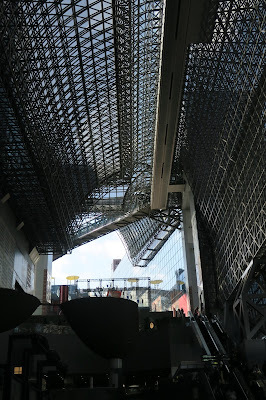 This picture really doesn't cover it, I just liked the roof structure. 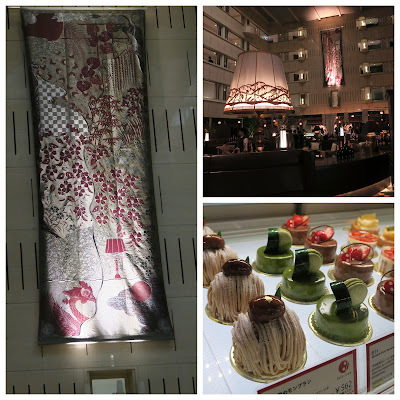 We stayed near the station at an older hotel, the Kyoto Century Hotel. Despite being older and less expensive it was still immaculate and the service (just like everywhere else in Japan) impeccable. The pastries were from the shop in the hotel. 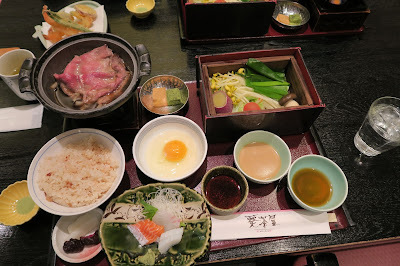 Breakfast offered a choice of western style or Japanese style breakfast buffet. They had a great what I called "old school" cocktail bar. 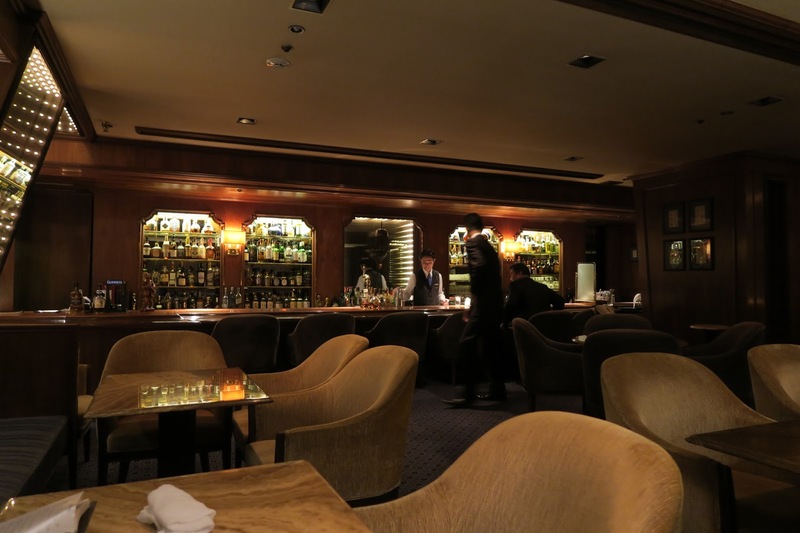 I don't mean that from a disparaging sense, it was very well kept classy with the bartender well versed in all manner of cocktail. 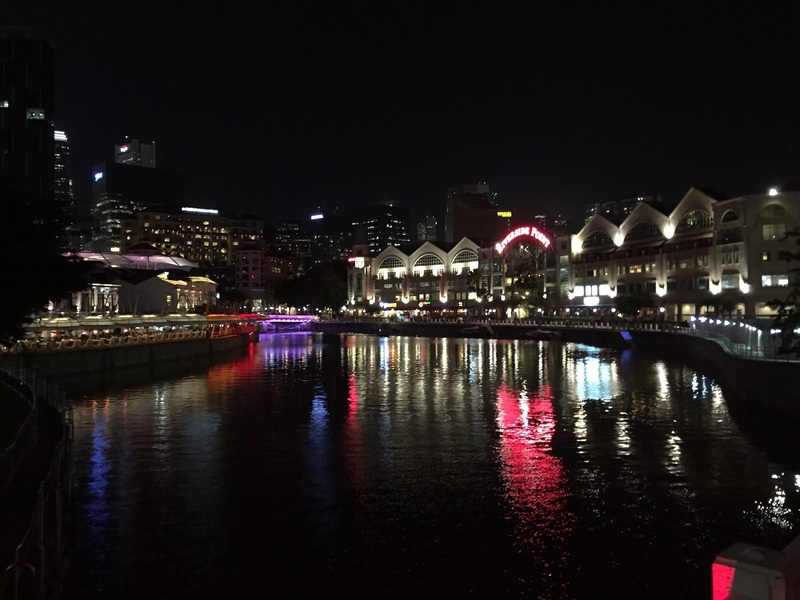 That night we took a bus into city and walked around. Wandering around the city was pretty busy at night. Lots of shops and restaurants, almost every one we visit was solid with reservations booked all night. We managed to get a seat it a Korean BBQ place featuring wagyu beef. I want to take a moment to say that there was no where in this country that I felt the least bit unsafe. We remarked at the fact that people parked their bikes unlocked on the city streets here. I'm sure there's a "bad" part somewhere but for the most part it's not like anywhere else I've ever been. Most places if you don't have your bike seat chained up folks will steal it, not here. 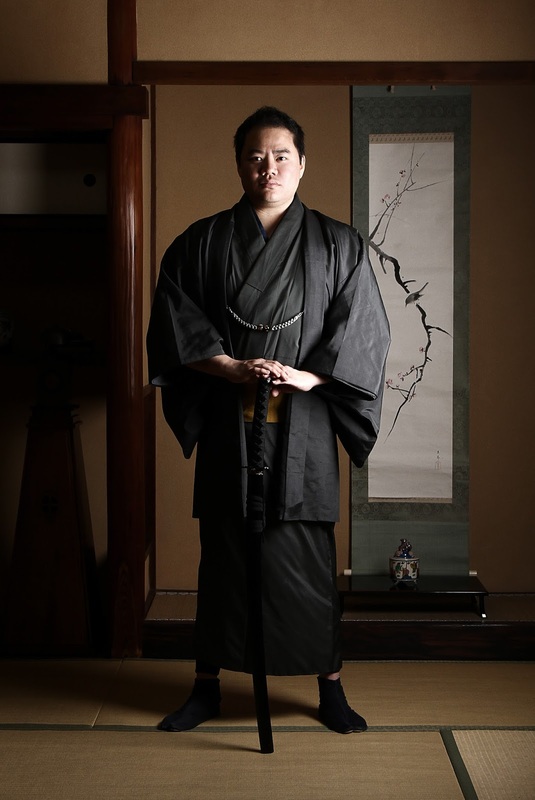 Here our instructor showed us what guests bring to a ceremony. 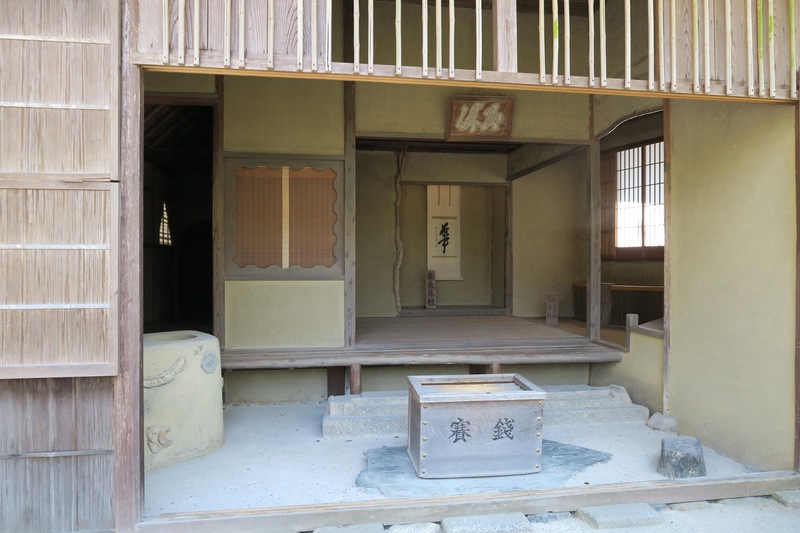 A small fan which is presented and you bow with to upon entry. A small knife for cutting the desserts, and paper used as a plate for the sweets served. To teach the tea ceremony in Kyoto you need a teaching certificate from one of the tea masters of the city who trace their lineage back to the original tea master that first developed the ceremony. 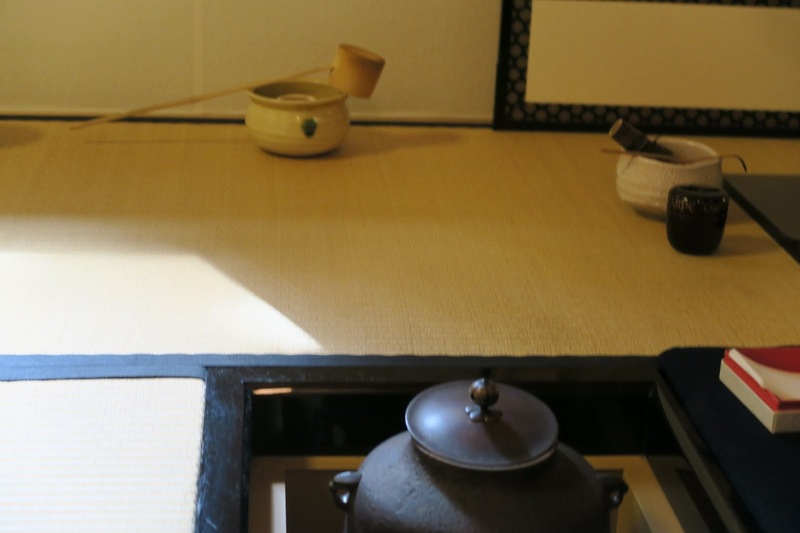 The selection of the tea powder vessel, temperature of the water, and even the tea scoop are all deliberate to show respect for the guests as well as to the day and season. The tea cup has a front and back. 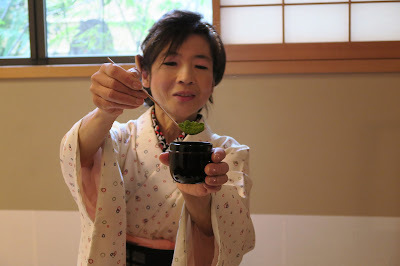 After the host prepares the tea they make two turns of the cup to present the nice front to the guest and likewise as the guest finishes they make two turns and presents the front to the host as they place back on the tatami. 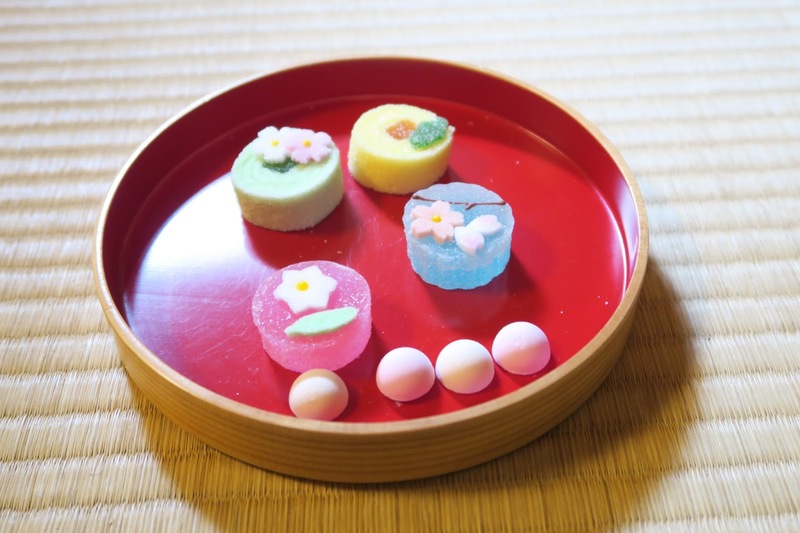 Here's a selection of sweets, the larger ones were a jelly sugary confection and the small dots were made of a special ultra fine sugar that melt in your mouth. 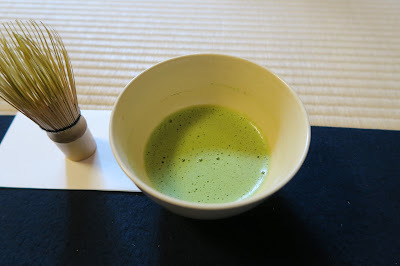 I think the sugar helps alleviate the bitterness of the macha. For a small cup of tea you use a fairly large scoop of tea. As you whisk the tea you make two clockwise circles and then a "W" shape whisking motion until you get a frothy tea. My guess is to aerate the tea and help reduce the bitterness. Matcha is made from grinding up young dried tea leaves. It has a very high antioxidant content and is considered very good for you. 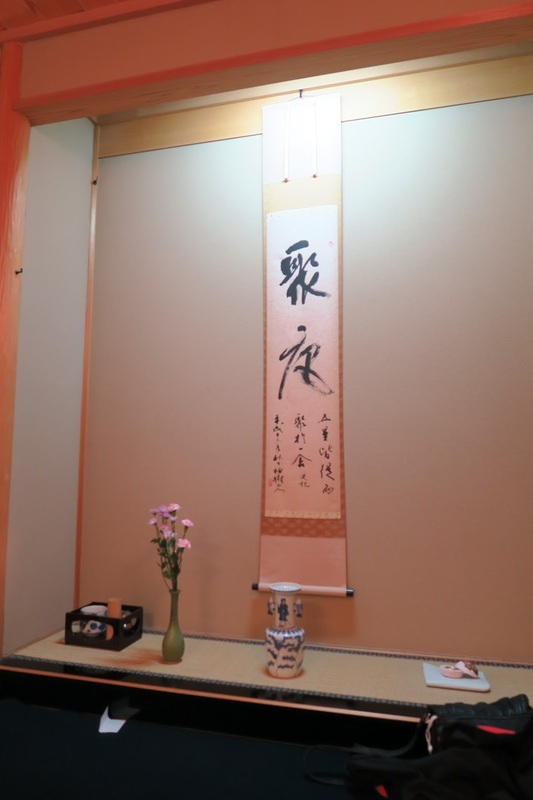 If you have free time in Kyoto you should definitely check out the Tea Ceremony room Ju-An it was a great education and we had a wonderful time. 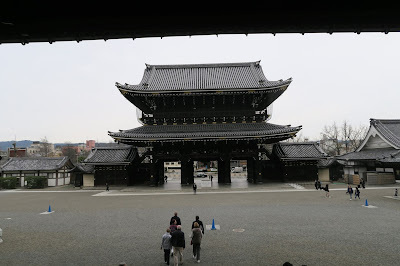 After tea class we walked around a bit and saw the Higashi Honganji temple. On the way there we were greeted by this beautiful Grey Heron. 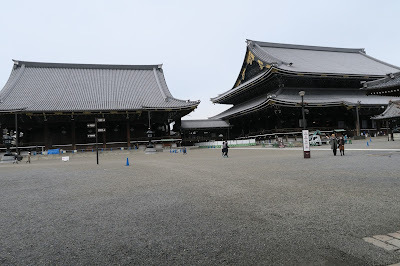 The temple was a massive walled off compound that is actively in use. 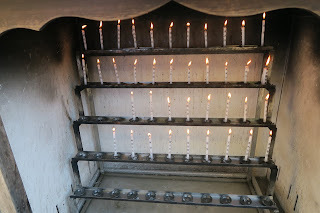 We observed an prayer ceremony. This is one of the two largest temples in Kyoto and considered the “head” temple built just over 400 years ago. 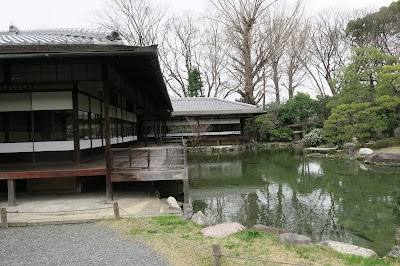 We went and visited the Shosei-en Garden just a few blocks away. It was originally built as a second residence for the Chief Priest of the Higashi Hongan-ji 370 years ago. Although we were early for cherry blossom season (by about two weeks) we did manage to catch a couple of early blooming trees here in the garden. 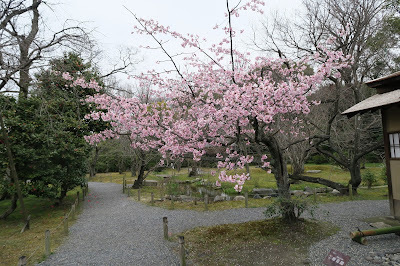 The one tree was quite a sight to behold, I can only imagine what it looks like to have them all in bloom. Another traditional Japanese lunch. Sashimi over rice with dried white fish and shredded egg with the accoutrements to make it a Chazuke (tea rice). 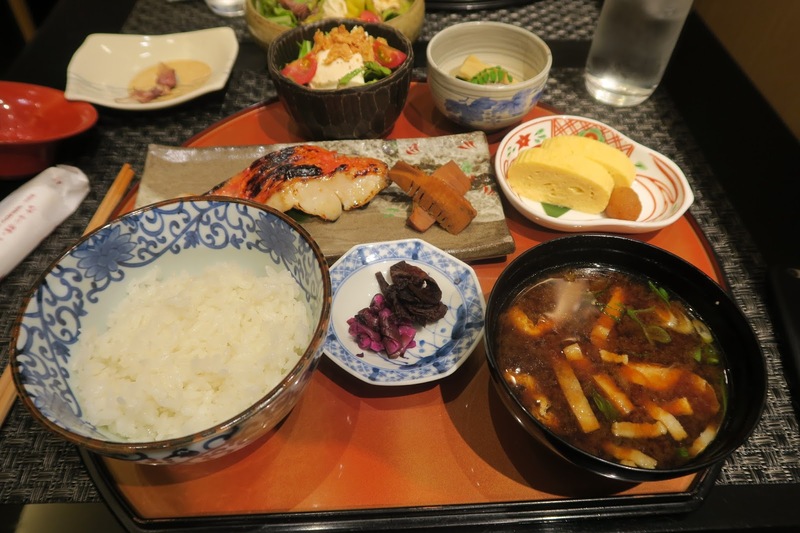 The side dishes included a fresh made tofu, some chicken karaga, smoked fish and azure bean and mocha dessert. More temples: we took a taxi to visit the Kiyomizu-dera temple. The temple is about 1238 years old and has been constructed without a single nail. It’s massive in scale and spreads out across the mountain side. 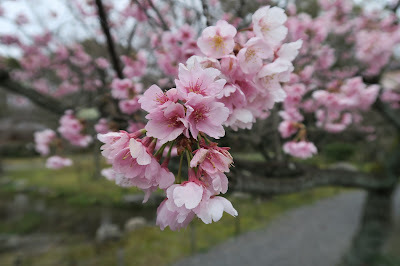 It’s known for it’s cherry blossoms as well which we were again lucky enough to catch a couple of blossoming trees. 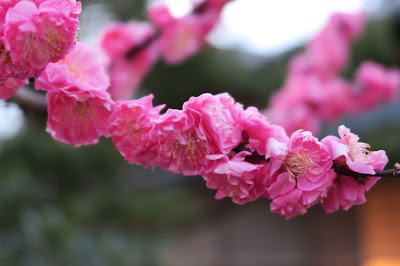 (I think the front ones were actually plum blossoms). This is the front gate. 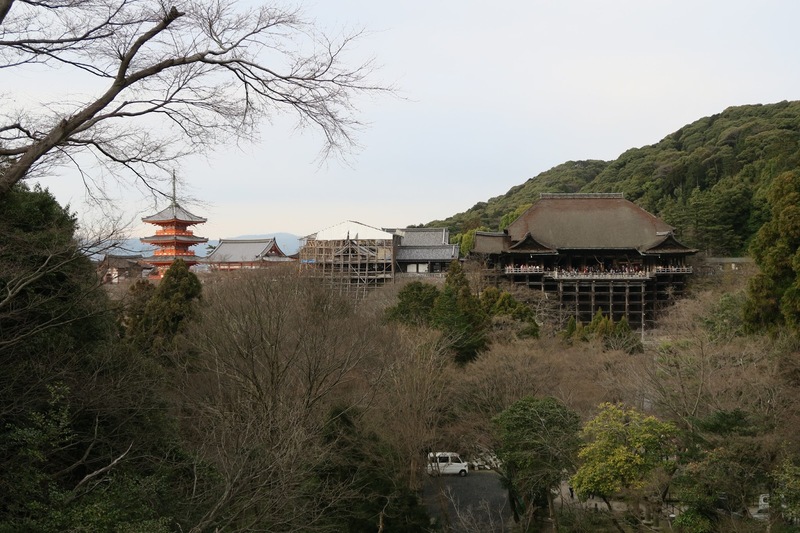 Here's a distance shot from the garden that includes the main temple, it's too bad part of it was under restoration. 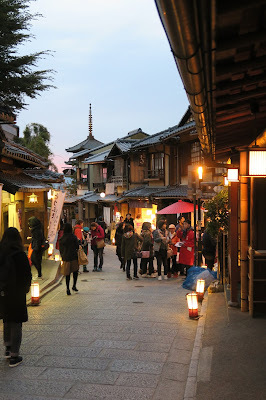 The streets leading to the temple were lined with shops and various food vendors. Particularly popular were vendors of triangular sweet called Yatsuhashi. 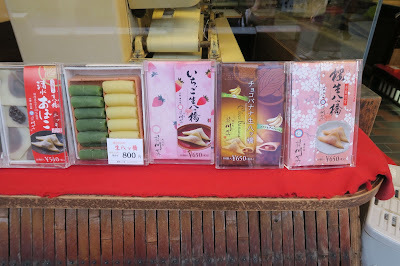 They came in mocha like sheets or folded in triangles filled with red bean or sesame and red bean (our favorite). An interesting Pate a choux like pastry stuffed with a matcha cream. Baumkuchen is a popular cake here brought over from Germany.The rings resemble the rings of a tree and hence the German name of "tree cake". 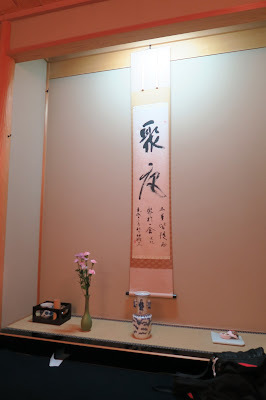 We had some of this at the tea ceremony class as well. Restaurant that makes their own tofu, the bottom poster show the process. This wasn't the only restaurant we encountered that served all tofu but we didn't get a chance to actually dine at one. Walking around further you can get a really view of the historical architecture of the buildings in Kyoto. Everything was illuminated by lanterns. 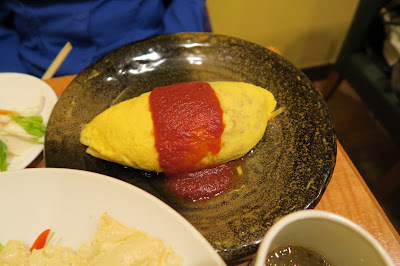 We returned back to Kyoto station and found dinner at a restaurant serving Omelette rice. Rice fried with ketchup wrapped in an thin egg wrapper. This is actually a very popular dish in Taiwan as well. My Mom would make this for us growing up and it was on my wife’s “To eat” list while we were here. I’ve made it before for a bento, the ketchup gives a sweet and tangy flavor to the fried rice it’s actually quite good (don’t knock it till you try it). 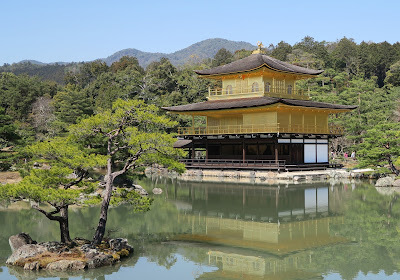 Next day we visited the famous Temple of the golden pavilion: Kinkaku-ji. 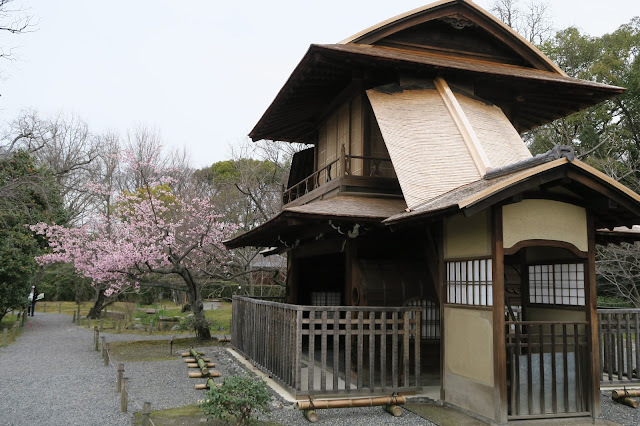 It was a residence of a previous Shogun who had the building converted to a Zen temple after he passed away. The garden still features preserved structures like the Shogun’s tea room. 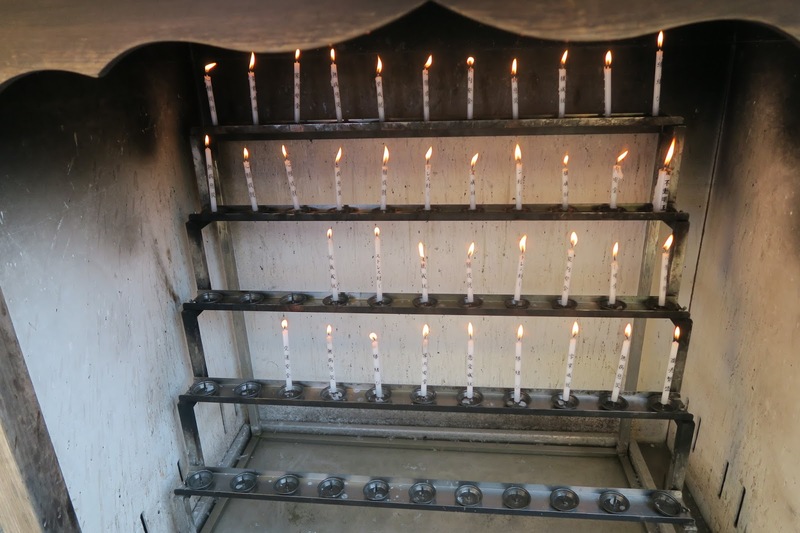 Prayer candles where you can pray for a variety of things. There are predefined inscriptions on candles that you pay a donation to light, so anything you need: good grades, safe travels, fortune etc it's covered. (I could have used these things when I was in school) They even have the label in english for us tourists. Finally, my wife wanted to do pictures in full traditional gear. There were lots of photo studios that provided this service so we picked one with the best reviews. 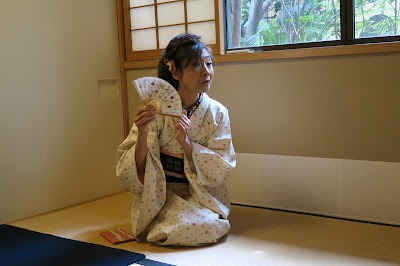 There were also plenty of kimono rentals that you could dress up in traditional gear to go to visit temples. 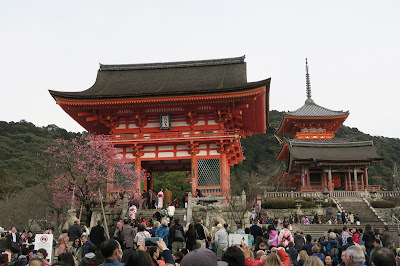 There were quite a few folks decked out while we were visiting but we were also told that during graduation many women dress up in formal kimonos as part of the graduation ceremony. The guys were stuck with their standard school uniform. So no telling if it was graduation or the "thing to do" while we were there. 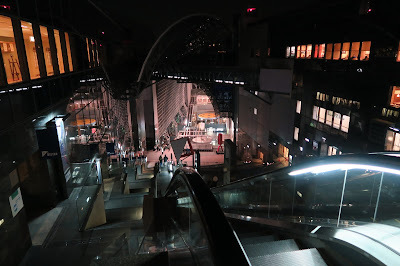 Finally after an exhausting amount of walking we finished and went back to Kyoto station and dined at a Washoku restaurant Eijuan. Fresh tofu salad with a ginger dressing, Tamoyagi (omelette) with soy daikon, Tsukemono (japanese pickle), sashimi, Mushroom miso soup, grilled Alfonsino. 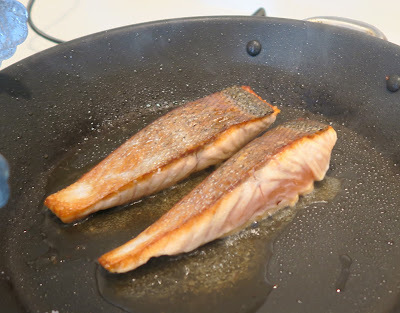 I’ve never had Alfonsino, it’s a firm fleshed white fish which kind of reminded me of a thin version of cod and has a bright red skin. Every dinner here has been just as much a feast for the eyes as for the stomach. I’ve always left feeling quite satisfied and “light” unlike some of the “food coma” inducing meals I’ve had back home. As much as carbs seem to be on my enemy list these days for food, it does make a case that maybe it’s not the carbs that are bad. After all, everyone here seems pretty healthy, but then again it maybe all that walking they do here. 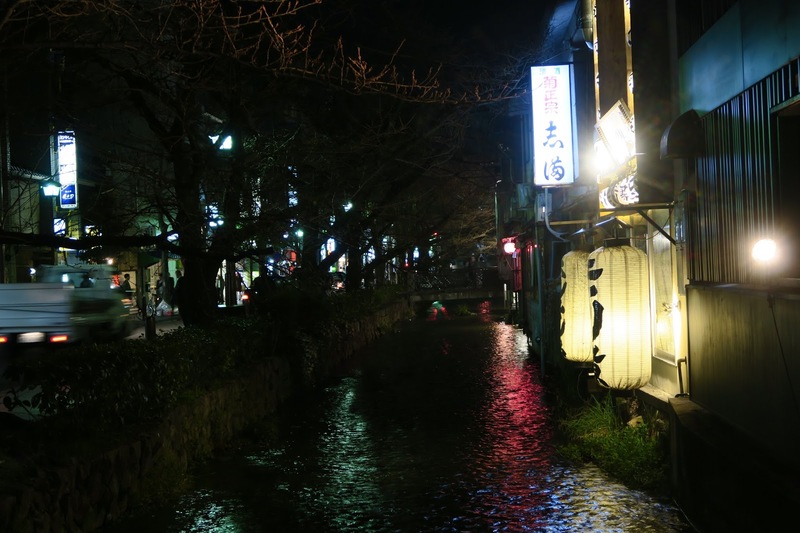 We had a great time in Kyoto, it’s definitely very different from Tokyo. 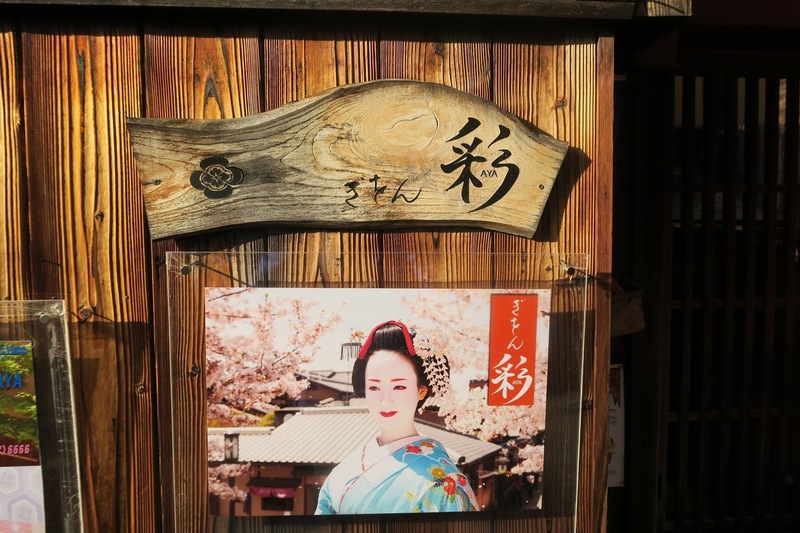 It’s a slower pace and more of a chance to see what traditional Japan looked like. 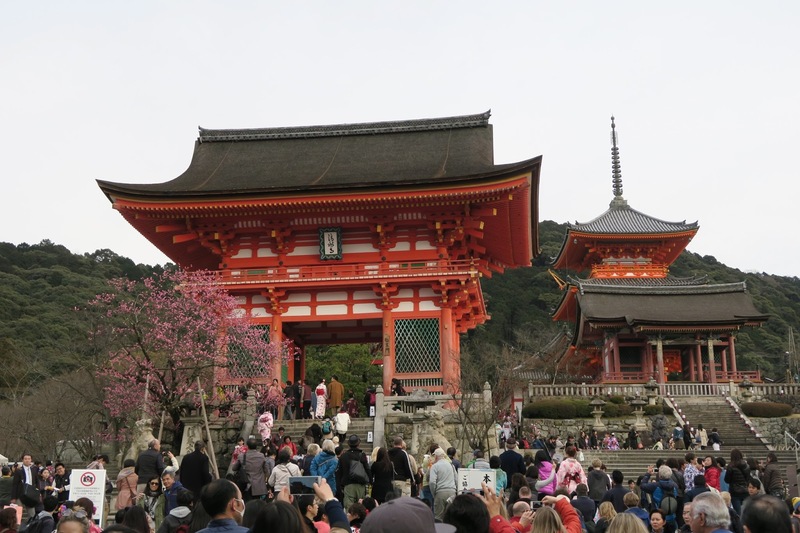 Lots of temples… LOTS of temples. But each one was unique and they were a lot of fun to visit. You know when you've gone on a long vacation and on the last day you get that "No place like home" kind of feeling? I didn't have that at the end of our trip. I definitely could have stayed a lot longer. There's so many more sights to see that we're pretty sure we're going back sometime soon. 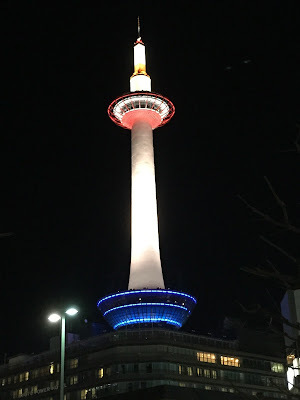 I've got one more post about our second fabulous meal so that's coming up, but this wraps up my post on our two city tour of Japan. I highly recommend a visit!